The Federal Reserve, the world's most important central bank, has a long history of creating aggregate demand bubbles in the United States (Niskanen 2003, 2006). In the ramp up to Britain's Northern Rock bank run in 2007 and the Lehman Brothers' bankruptcy in September 2008, the Fed not only created a classic aggregate demand bubble, but also facilitated the spawning of many market-specific bubbles. The bubbles in the housing, equity, and commodity markets could have been easily detected by observing the price behavior in those markets, relative to changes in the more broadly based consumer price index. True to form, the Fed officials have steadfastly denied any culpability for creating the bubbles that so spectacularly burst during the Panic of 2008–09. If all that is not enough, Fed officials, as well as other members of the money and banking establishments in the United States and elsewhere, have embraced the idea that stronger, more heavily capitalized banks are necessary to protect taxpayers from future financial storms. This embrace, which is reflected in the Bank for International Settlements' most recent capital requirement regime (Basel III) and related country-specific capital requirement mandates, represents yet another great monetary misjudgment (error). Indeed, in its stampede to make banks "safer", the establishment has spawned a policy-induced doom loop. Paradoxically, banks in the Eurozone, the United Kingdom, and the United States—among others—have been weakened by the imposition of new bank regulations in the middle of a slump. New bank regulations have suppressed the money supply and economic activity, rendering banks less "safe" (Hanke 2012). Just what is an aggregate demand bubble? This type of bubble is created when the Fed's laxity allows aggregate demand to grow too rapidly. Specifically, an aggregate demand bubble occurs when nominal final sales to U.S. purchasers (GDP – exports + imports – change in inventories) exceeds a trend rate of nominal growth consistent with "moderate" inflation by a significant amount. During the 25 years of the Greenspan-Bernanke reign at the Fed, nominal final sales grew at a 5.1 percent annual trend rate. This reflects a combination of real sales growth of 3 percent and inflation of 2.1 percent (see the accompanying chart). But, there were deviations from the trend. The first deviation began shortly after Alan Greenspan became chairman of the Fed. In response to the October 1987 stock market crash, the Fed turned on its money pump and created an aggregate demand bubble: over the next year, final sales shot up at a 7.5 percent rate, well above the trend line. Having gone too far, the Fed then lurched back in the other direction. The ensuing Fed tightening produced a mild recession in 1991. During the 1992–97 period, growth in the nominal value of final sales was quite stable. But, successive collapses of certain Asian currencies, the Russian ruble, the Long-Term Capital Management hedge fund, and the Brazilian real triggered another excessive Fed liquidity injection. This monetary misjudgment resulted in a boom in nominal final sales and an aggregate demand bubble in 1999–2000. That bubble was followed by another round of Fed tightening, which coincided with the bursting of the equity bubble in 2000 and a slump in 2001. The last big jump in nominal final sales was set off by the Fed's liquidity injection to fend off the false deflation scare in 2002 (Beckworth 2008). Fed Governor Ben S. Bernanke (now chairman) set off a warning siren that deflation was threatening the U.S. economy when he delivered a dense and noteworthy speech before the National Economists Club on November 21, 2002 (Bernanke 2002). Bernanke convinced his Fed colleagues that the deflation danger was lurking. As Greenspan put it, "We face new challenges in maintaining price stability, specifically to prevent inflation from falling too low" (Greenspan 2003). To fight the alleged deflation threat, the Fed pushed interest rates down sharply. By July 2003, the Fed funds rate was at a then-record low of 1 percent, where it stayed for a year. This easing produced the mother of all liquidity cycles and yet another massive demand bubble. Artificially "low" interest rates induced investors to aggressively speculate by chasing yield in "risky" venues and to ramp-up their returns by increasing the amount of leverage they applied. These activities generated market-specific bubbles (Garrison 2011). Over the past quarter century, and contrary to the Fed's claims, the central bank overreacted to real or perceived crises and created three demand bubbles. The last represents one bubble too many—and one that is impacting us today. During the Greenspan-Bernanke era the Fed has embraced the view that stability in the economy and stability in prices are mutually consistent. As long as inflation remains at or below its target level, the Fed's modus operandi is to panic at the sight of real or perceived economic trouble and provide emergency relief. It does this by pushing interest rates below where the market would have set them. With interest rates artificially low, consumers reduce savings in favor of consumption, and entrepreneurs increase their rates of investment spending. This creates an imbalance between savings and investment, and sets the economy on an unsustainable growth path. This, in a nutshell, is the lesson of the Austrian critique of central banking. Austrian economists warned that price level stability might be inconsistent with economic stability. They placed great stress on the fact that the price level, as typically measured, extends only to goods and services. Asset prices are excluded. (The Fed's core measure for consumer prices, of course, doesn't even include all goods and services.) The Austrians concluded that monetary stability should include a dimension extending to asset prices and that changes in relative prices of various groups of goods, services and assets are of utmost importance. For the Austrians, a stable economy might be consistent with a monetary policy under which prices were gently falling (Selgin 1997). The most recent aggregate demand bubble was not the only bubble that the Fed was facilitating. As the accompanying chart shows, the Fed's favorite inflation target—the consumer price index, absent food and energy prices—was increasing at a regular, modest rate. Over the 2003–08 (Q3) period, this metric increased by 12.5 percent. The Fed's inflation metric signaled "no problems". But, as Haberler emphasized, "the relative position and change of different groups of prices are not revealed, but are hidden and submerged in a general [price] index" (Haberler 1928: 444). Unbeknownst to the Fed, abrupt shifts in major relative prices were underfoot. For any economist worth his salt (particularly Austrians), these relative price changes should have set off alarm bells. Indeed, sharp changes in relative prices are a signal that, under the deceptively smooth surface of a general price index of stable prices, basic maladjustments are occurring. And it is these maladjustments that, according to Haberler, hold the key to Austrian business cycle theory (Haberler 1986). Just what sectors realized big swings in relative prices during the last U.S. aggregate demand bubble? Housing prices, measured by the Case-Shiller home price index, were surging, increasing by 45 percent from the first quarter in 2003 until their peak in the first quarter of 2006. Share prices were also on a tear, increasing by 66 percent from the first quarter of 2003 until they peaked in the first quarter of 2008. The most dramatic price increases were in the commodities, however. Measured by the Commodity Research Bureau's spot index, commodity prices increased by 92 percent from the first quarter of 2003 to their pre-Lehman Brothers peak in the second quarter of 2008. If nothing else, these dramatic swings in relative prices provides persuasive evidence that money is not neutral—a fundamental insight made by Austrian economists (Ebeling 2010). Careful research—even by non-Austrian governors of the Federal Reserve System—has verified this proposition (Maisal 1967). The dramatic jump in commodity prices was due, in large part, to the fact that a weak dollar accompanied the mother of all liquidity cycles. Measured by the Federal Reserve's Trade-Weighted Exchange Index for major currencies, the greenback fell in value by 30.5 percent from 2003 to mid-July 2008. As every commodity trader knows, all commodities, to varying degrees, trade off changes in the value of the dollar. When the value of the dollar falls, the nominal dollar prices of internationally-traded commodities priced in dollars—like gold, rice, corn, and oil—must increase because more dollars are required to purchase the same quantity of any commodity. Indeed, in my July 2008 testimony before the House Budget Committee on "Rising Food Prices: Budget Challenges", I estimated that the weak dollar was the major contributor to what then, only a few months before the collapse of Lehman Brothers, was viewed as the world's most urgent economic problem: world-record commodity prices. My estimates of the depreciating dollar's contribution to surging commodity prices over the 2002–July 2008 period was 51 percent for crude oil and 55.5 percent for rough rice, two commodities that set record-high prices (nominal) in July 2008 (Hanke 2008). Before leaving the market-specific bubbles, two points merit mention. First, the relative increase in housing prices was clearly signaling a bubble in which prices were diverging from housing's fundamentals. A simple "back-of-the-envelope" calculation confirms a bubble. The so-called demographic "demand" for housing in the U.S. during the first decade of the 21st century was about 1.5 million units per year. This includes purchases of first homes by newly formed families, purchases of second homes, and the replacement of about 300,000 units per year that have been lost to fire, floods, widening of highways, and so forth (Aliber 2010). During the bubble years of 2002–06, housing starts were two million per year. In consequence, an "excess supply" of about 500,000 units, or 25 percent of the annual new starts, was being created each year. These data suggest that housing prices in the 2002–06 period should have been very weak, or declining. Instead, they increased by 45 percent. The Fed, even according to the minutes of the Federal Open Market Committee of June 2005, failed to spot what was an all-too obvious housing bubble (Harding 2011). The U.S. housing bubble illustrates yet another Austrian insight. For the Austrians, things go wrong when a central bank sets short-term interest rates at artificially low levels. Such rates fuel credit booms, with a decline in the discount rate pumping up the present value of capital projects. An artificially low interest rate alters the evaluation of projects – with longer-term, more capital-intensive projects becoming more attractive relative to shorter-term, less capital-intensive ones (Machlup 1935). In consequence, businesses overestimate the value of long-lived investments and an investment-led boom ensues – where a plethora of investment dollars is locked up into excessively long-lived and capital-intensive projects. Investment-led booms sow the seeds of their own destruction. The booms end in busts. These are punctuated by bankruptcies and a landscape littered with malinvestments made during the credit booms. Many of these malinvestments never see the light of day. Austrian theory played out to perfection during the most recent boom-bust cycle. By July 2003, the Federal Reserve had pushed the federal funds interest rate down to what was then a record low of 1 percent, where it stayed for a full year. During that period, the natural (or neutral) rate of interest was in the 3-4 percent range. With the fed funds rate well below the natural rate, a credit boom was off and running. And as night follows day, a bust was just around the corner. A second point worth mentioning is that, while operating under a regime of inflation targeting and a floating U.S. dollar exchange rate, Chairman Bernanke has seen fit to ignore fluctuations in the value of the dollar. Indeed, changes in the dollar's exchange value do not appear as one of the six metrics on "Bernanke's Dashboard"—the one the chairman uses to gauge the appropriateness of monetary policy (Wessel 2009: 271). Perhaps this explains why Bernanke has been dismissive of questions suggesting that changes in the dollar's exchange value influence either commodity prices or more broad gauges of inflation (McKinnon 2010, Reddy and Blackstone 2011). It is remarkable that the steep decline in the dollar during the 2002–July 2008 period (and associated surge in commodity prices), the subsequent surge in the dollar's value after Lehman Brothers collapsed (and associated plunge in commodity prices), and the renewed decline in the dollar's exchange rate after the first quarter of 2009 (and associated new surge in the CRB spot index – see the accompanying chart) has left Fed officials in denial. And if that's not enough, the dollar's exchange rate appreciated in the October 2009- June 2010 period, and the commodity bull market temporarily stalled. But, in the face of this evidence, the Fed officials continue to be stubbornly blind to the fact that there is a link between the dollar's exchange value and commodity prices (Reddy and Blackstone 2011). This relationship translates to the overall price level as well. As Nobelist Prof. Robert Mundell has convincingly argued, changes in exchange rates transmit inflation (or deflation) into economies, and they can do so rapidly (Mundell 2011). This was the case during the financial crisis (see the accompanying chart). Indeed, from 2007-09, the monthly year-over-year percent changes in the consumer price index and the USD/EUR exchange rate have a correlation of 0.75. As can be seen in the accompanying chart, changes to the CPI have about a two-month lag – when we factor in this lag, the correlation is .94. By ignoring this, Bernanke was "flying blind" in the initial months of the crisis. In consequence, the Fed failed to stabilize the USD/EUR exchange rate, which swung dramatically in the months surrounding the collapse of Lehman Brothers, in September 2008 (see the accompanying table). Source: Federal Reserve Economic Database and Calculations by Prof. Dr. Steve H. Hanke. Accordingly, the Fed acted too slowly in cutting the federal funds rate to stabilize inflation. If Bernanke had been monitoring the USD/EUR exchange rate, he would have known to act much sooner than December 2008 – almost two months after the Lehman bankruptcy. Indeed, if he had done so, the bankruptcy may never have occurred in the first place. In the days leading up to the September 15, 2008 bankruptcy, Lehman Brothers executives were in talks to raise a substantial amount of capital from foreign banks. Unfortunately for Lehman Brothers, during that same time, the dollar was strengthening sharply. So, for the foreign potential investors, the price of the dollar-denominated Lehman Brothers shares was increasing every day. In the end, Lehman was unable to raise fresh capital and was forced to declare bankruptcy. The foreign banks did eventually buy up the various parts of Lehman Brothers – at a tidy, bankruptcy-induced discount, of course. This happened right about the time Bernanke woke up and slammed on the Fed's accelerator – dropping the federal funds rate to close to zero – in both cases, too little, too late. In addition to not displaying the dollar's exchange rate on his dashboard, Chairman Bernanke's dashboard doesn't display money-supply gauges. This wasn't always the case. In the late summer of 1979, when Paul Volcker took the reins of the Federal Reserve System, the state of the U.S. economy's health was "bad". Indeed, 1979 ended with a double-digit inflation rate of 13.3 percent. Chairman Volcker realized that money matters, and it didn't take him long to make his move. On Saturday, October 6, 1979, he stunned the world with an unanticipated announcement. He proclaimed that he was going to put measures of the money supply on the Fed's dashboard. For him, it was obvious that, to restore the U.S. economy to good health, inflation would have to be wrung out of the economy. And to kill inflation, the money supply would have to be controlled. Chairman Volcker achieved his goal. By 1982, the annual rate of inflation had dropped to 3.8 percent – a great accomplishment. The problem was that the Volcker inflation squeeze brought with it a relatively short recession (less than a year) that started in January 1980, and another, more severe slump that began shortly thereafter and ended in November 1982. Chairman Volcker's problem was that the monetary speedometer installed on his dashboard was defective. Each measure of the money supply (M1, M2, M3 and so forth) was shown on a separate gauge, with the various measures being calculated by a simple summation of their components. The components of each measure were given the same weight, implying that all of the components possessed the same degree of moneyness – usefulness in immediate transactions where money is exchanged between buyer and seller. Why is the Divisia metric the superior money supply measure, and why did it diverge so sharply from the Fed's conventional measure (M2)? Money takes the form of various types of financial assets that are used for transaction purposes and as a store of value. Money created by a monetary authority (notes, coins, and banks' deposits at the monetary authority) represents the underlying monetary base of an economy. This monetary base, or high-powered money, is imbued with the most moneyness of the various types of financial assets that are called money. The monetary base is ready to use in transactions in which goods and services are exchanged for "money". In addition to the assets that make up base money, there are many others that possess varying degrees of moneyness – a characteristic which can be measured by the ease of and the opportunity costs associated with exchanging them for base money. These other assets are, in varying degrees, substitutes for money. That is why they should not receive the same weights when they are summed to obtain a broad money supply measure. Instead, those assets that are the closest substitutes for base money should receive higher weights than those that possess a lower degree of moneyness. Now, let's come back to the huge divergences between the standard simple-sum measures of M2 that Chairman Volcker was observing and the true Divisia M2 measure. As the Fed pushed the fed funds rate up, the opportunity cost of holding cash increased. In consequence, retail money market funds and time deposits, for example, became relatively more attractive and received a lower weight when measured by a Divisia metric. Faced with a higher interest rate, people had a much stronger incentive to avoid "large" cash and checking account balances. As the fed funds rate went up, the divergence between the simple-sum and Divisia M2 measures became greater and greater. When available, Divisia measures are the "best" measures of the money supply. But, how many classes of financial assets that possess moneyness should be added together to determine the money "supply"? This is a case in which the phrase "the more the merrier" applies. When it comes to money, the broadest measure is the "best". In the U.S., we are fortunate to have Divisia M4 available from the Center for Financial Stability in New York (Barnett, et al. forthcoming). My view is that the crisis was largely caused by factors that had very little to do with monetary policy. And my main conclusion for money policy is that flexible inflation targeting—applied in the right way and in particular using all the information about financial conditions that is relevant for the forecast of inflation and resource utilization at any horizon—remains the best-practice monetary policy before, during, and after the financial crisis [Svensson 2010: 1]. For central bankers, the "name of the game" is to blame someone else for the world's economic and financial troubles (Bernanke 2010, Greenspan 2010). How can this be, particularly when money is at the center? It should be pointed out that a very large part of the information available on most government issues originates within the government. On several occasions in my hearing (I don't know whether it is in his writing or not but I have heard him say this a number of times) Milton Friedman has pointed out that one of the basic reasons for the good press the Federal Reserve Board has had for many years has been that the Federal Reserve Board is the source of 98 percent of all writing on the Federal Reserve Board. Most government agencies have this characteristic. Friedman's assertion has subsequently been supported by Lawrence H. White's research. In 2002, 74 percent of the articles on monetary policy published by U.S. economists in U.S.-edited journals appeared in Fed-sponsored publications, or were authored (or co-authored) by Fed staff economists (White 2005, Grim 2009). For powerful and uncompromising dissidents, the establishment can impose what it deems to be severe penalties. For example, after the distinguished monetarist and one of the founders of the Shadow Open Market Committee, Karl Brunner, was perceived as a credible threat, he was banned from entering the premises of the Federal Reserve headquarters in Washington, D.C. Security guards were instructed to never allow Brunner to enter the building. This all backfired. Indeed, the great Swiss economist Brunner confided to Apostolos Serletis that the ban had done wonders for his career (Serletis 2006: xiii). Alas, most money and banking professionals would, unlike Brunner, find a Fed ban to be a burden they could not bear. Moreover, doctored accounts often gain wide circulation in the sphere of economics. Unfortunately, false beliefs are very difficult to overturn by facts, and fallacies play a significant role in economic policy discourse. White (2008) has masterfully shown, for example, how in an attempt to neutralize policy advice by Austrian-oriented economists, prominent Keynesian-oriented economists have simply fabricated what Hayek and Robbins had to say about economic policy during the Great Depression. Indeed, in economics and in history, as well, such falsehoods are all too common. You thought you knew that the Duke of Wellington whipped Napoleon at the Battle of Waterloo. But, according to the expert on Waterloo, Peter Hofschr?er, Wellington's army of 68,000 men was locked in a bloody stalemate with Napoleon's force of 73,140 until late in the afternoon of June 18, 1815 (Hofschr?er 2005). That's when Field Marshall Bl?cher's 47,000 Prussian troops entered the field of battle and turned the tide. The Iron Duke's official account has Prince Bl?cher failing to arrive until early evening and with only 8,000 troops. Somehow 39,000 Prussians simply vanished. As they say, the rest is history – literally history as written by Wellington. Military history is written by the victors. Economic history is written, to a degree, by central bankers. In both cases you have to take official accounts with a large dose of salt. Consider the myth of the undercapitalized bank, which has spawned a mountain of burdensome banking regulations over the past years – most notably, Basel III. The story begins in Britain and with infamous Northern Rock affair. It is important to note that this event marked the beginning of the financial crisis (Hanke 2013). And, what's more, the policy response to Northern Rock – namely Basel III – would come to define the post-crisis era. On August 9, 2007, the European money markets froze up after BNP Paribas announced that it was suspending withdrawals on two of its funds that were heavily invested in the US subprime credit market. Northern Rock, a profitable and solvent bank, relied on these wholesale money markets for liquidity. Unable to secure the short-term funding it needed, Northern Rock turned to the Bank of England for a relatively modest emergency infusion of liquidity (3 billion GBP). This lending of last resort might have worked, had a leak inside the Bank of England not tipped off the BBC to the story on Thursday, September 13, 2007. The next morning, a bank run ensued, and by Monday morning, Prime Minister Gordon Brown had stepped in to guarantee all of Northern Rock's deposits. The damage, however, was already done. The bank run had transformed Northern Rock from a solvent (if illiquid) bank to a bankrupt entity. By the end of 2007, over 25 billion GBP of British taxpayers' money had been injected into Northern Rock. The company's stock had crashed, and a number of investors began to announce takeover offers for the failing bank. But, this was not to be – the UK Treasury announced early on that it would have the final say on any proposed sale of Northern Rock. Chancellor of the Exchequer Allistair Darling then proceeded to bungle the sale, and by February 7, 2008, all but one bidder had pulled out. Ten days later, Darling announced that Northern Rock would be nationalized. Looking to save face in the aftermath of the scandal, Gordon Brown – along with King, Darling and their fellow members of the political chattering classes in the UK – turned their crosshairs on the banks, touting "recapitalization" as the only way to make banks "safer" and prevent future bailouts. In the prologue to Brown's book, Beyond the Crash, he glorifies the moment when he underlined twice "Recapitalize NOW." Indeed, Mr. Brown writes, "I wrote it on a piece of paper, in the thick black felt-tip pens I've used since a childhood sporting accident affected my eyesight. I underlined it twice." I suspect that moment occurred right around the time his successor-to-be, David Cameron, began taking aim at Brown over the Northern Rock affair. Clearly, Mr. Brown did not take kindly to being "forced" to use taxpayer money to prop up the British banking system. Nor did the taxpayers take kindly to having their precious pounds pulled from their wallets. But, rather than directing his ire at Mervyn King and the leak at the Bank of England that set off the Northern Rock bank run, Brown opted for the more politically expedient move – the tried and true practice of bank-bashing. As part of the money and banking establishment's blame game, the accusatory finger has been pointed at commercial bankers. The establishment asserts that banks are too risky and dangerous because they are "undercapitalized". It is, therefore, not surprising that the Bank for International Settlements located in Basel, Switzerland has issued new Basel III capital rules. These will bump banks' capital requirements up from 4 percent to 7 percent of their risk-weighted assets. And if that is not enough, the Basel Committee agreed in late June to add a 2.5 percent surcharge on top of the 7 percent requirement for banks that are deemed too-big-to-fail. For some, even these hurdles aren't high enough. The Swiss National Bank wants to impose an ultra-high 19 percent requirement on Switzerland's two largest banks, UBS and Credit Suisse (Braithwaite and Simonian 2011). In the United States, officials from the Fed and the Federal Deposit Insurance Corporation are also advocating capital surcharges for "big" banks. The oracles of money and banking have demanded higher capital-asset ratios for banks—and that is exactly what they have received. Just look at what has happened in the United States. Since the onset of the Panic of 2008–09, U.S. banks have, under political pressure and in anticipation of Basel III, increased their capital-asset ratios (see the accompanying chart). The oracles have erupted in cheers at the increased capital-asset ratios. They assert that more capital has made the banks stronger and safer. While at first glance that might strike one as a reasonable conclusion, it is not. For a bank, its assets (cash, loans and securities) must equal its liabilities (capital, bonds, and liabilities which the bank owes to its shareholders and customers). In most countries, the bulk of a bank's liabilities (roughly 90 percent) are deposits. Since deposits can be used to make payments, they are "money". Accordingly, most bank liabilities are money. To increase their capital-asset ratios, banks can either boost capital or shrink assets. If banks shrink their assets, their deposit liabilities will decline. In consequence, money balances will be destroyed. So, paradoxically, the drive to deleverage banks and to shrink their balance sheets, in the name of making banks safer, destroys money balances. This, in turn, dents company liquidity and asset prices. It also reduces spending relative to where it would have been without higher capital-asset ratios. The other way to increase a bank's capital-asset ratio is by raising new capital. This, too, destroys money. When an investor purchases newly issued bank equity, the investor exchanges funds from a bank deposit for new shares. This reduces deposit liabilities in the banking system and wipes out money. By pushing banks to increase their capital-asset ratios – to allegedly make banks stronger – the oracles have made their economies (and perhaps their banks) weaker (Congdon 2011). But, how could this be? After all, central banks around the world have turned on the money pumps. Shouldn't this be ratcheting up money supply growth? The problem is that central banks only produce what Lord Keynes referred to in 1930 as "state money". And state money (also known as base or high-powered money) is a rather small portion of the total "money" in an economy. This is the case because the commercial banking system creates most of the money in the economy by creating bank deposits, or what Keynes called "bank money" (Keynes 1930). Since August 2008, the month before Lehman Brothers collapsed, the supply of state money has more than tripled, while bank money shrunk by 12.5 percent – resulting in a decline in the total money supply (M4) of almost 2 percent (see the accompanying chart). In consequence, the share of the total broad money supply accounted for by the Fed has jumped from 5 percent in August 2008 to 15 percent today. Accordingly, bank money as percent of the total money supply has dropped from a whopping 95 percent to 85 percent. The disturbing course that has been taken by the money supply in the U.S. shows why we had a bubble, and why the U.S. is mired in a growth recession, at best (see the accompanying chart). If Fed Chairman Bernanke had a money supply indicator – any money supply indicator – on his dashboard, he would, well, see reality. Money matters. It is clear that while Fed-produced state money has exploded, privately-produced bank money has imploded. The net result is a level of broad money that is well below where it would have been if broad money would have followed a trend rate of growth. The post-crisis monetary policy mix has brought about a massive opening of the state money-supply spigots, and a significant tightening of those in the private sector. Since bank money as a portion of the broad money supply in the U.S. is now five and a half times larger than the state portion, the result has been a decrease in the money supply since the Lehman Brothers collapse. So, when it comes to money in the U.S., policy has been, on balance, contractionary – not expansionary. This is bad news, since monetary policy dominates fiscal policy. Wrongheaded public policies have put the kibosh on banks and so-called shadow banks, which are the primary bank money-supply engines. They have done this via new and prospective bank regulations flowing from the Dodd-Frank legislation, new (more stringent) Basel III capital and liquidity requirements, and uncertainty as to what Washington might do next. In consequence, the banks' loan books that are subject to higher capital-to-asset mandates (commercial and industrial loans, real estate loans and interbank loans) have shrunk (see the accompanying chart). The oracles' embrace of higher capital-asset ratios for banks in the middle of the most severe slump since the Great Depression has been a great blunder. While it might have made banks temporarily "stronger", it has contributed mightily to plunging money supply metrics and very weak economic growth. Until the oracles come to their senses and reverse course on their demands for ever-increasing capital-asset ratios, we can expect continued weak (or contracting) money growth, economic malaise, increasing debt problems, continued market volatility, and a deteriorating state of confidence. Monetary misjudgments and malfeasance have characterized U.S. policy. Artificially low Fed funds rates enabled both the aggregate and market-specific demand bubbles to be blown. Even though there were numerous signs that the financial systems in Europe and the United States were enduring severe stresses and strains in 2007, the money and banking oracles failed to anticipate and prepare for the major financial and economic turmoil that visited them in 2008–09. Indeed, the oracles' ad hoc reactions turned the turmoil into a panic. Since then, members of the money and banking establishment have been busy dissembling. They have hung out "not culpable" signs and pointed their powerful accusatory fingers at others. The Fed has a propensity to create aggregate demand bubbles. These bubbles carry with them market-specific bubbles that distort relative prices and the structure of production. Contrary to the assertions of the stabilizers who embrace inflation targeting, these relative price distortions are potentially dangerous and disruptive. If that was not enough, policymakers have latched onto a new mantra: to make banks "safe", higher capital requirements are absolutely essential. The banks have obliged and increased their capital-asset ratios. In consequence, the banks' loan books that are subject to higher capital-to-asset mandates (commercial and industrial loans, real estate loans and interbank loans) have shrunk. With that, broad money (Divisia M4) growth rates have remained submerged and a typical post-slump economic rebound has failed to materialize. 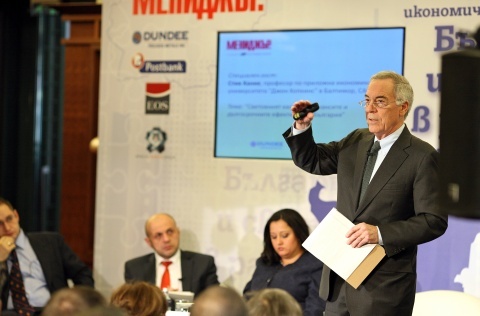 *A paper provided for the International Economic Conference: Bulgaria and the World in Progress; Sofia, Bulgaria (12 December 2012), sponsored by Manager Magazine. ** Steve H. Hanke is a Professor of Applied Economics at The Johns Hopkins University in Baltimore, Maryland, USA and a Senior Fellow at the Cato Institute in Washington, D.C., USA. He served as an adviser to President Petar Stoyanov from 1997-2001.